Out of all the five Frontiers releases planned for this week, the Dimino album was the one that I wanted to hear the most. Most people who will be drawn to the Frontiers roster will know of Frank Diminos past glory and pedigree with glam rockers Angel. Yes you remember them, the ones Gene Simmons plucked from obscurity, and dropped them back into obscurity when they failed to ignite on five albums. Perhaps it was the androgynous white outfits, or maybe just that they were overhyped and not that good! As all good Frontier bands projects, this one is no different. Pick a singer from the past (check), put him with some other old musicians (check), and hopefully some of the cream will rise to the top? 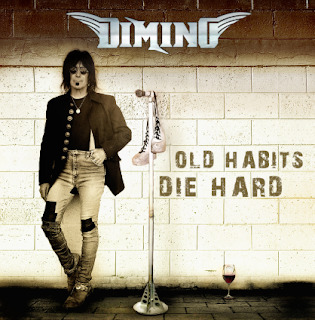 Involved in Dimino are Oz Fox (Stryper), Eddie Ojeda (Twisted Sister), Ricky Medlocke (Blackfoot, Lynyrd Skynyrd), and former Angel band mates Punky Meadows and Barry Brandt. First thing to not is that Frank sounds good. Great even. Even better is the fact that he has gone for his own thing and not done like others have and tried to recreate the past he had with Angel. ‘Old Habits Die Hard’ is a straight 6, out and out powerhouse rock album. It’s a mystery why he hasn’t been plying his trade globally these past years as he is a man right on top of his game. I’ve hyped up a few Frontiers releases this year, but if you have to buy one, make it this one! If there’s to be a 3rd Frontiers fest next year, Dimino surely must be on it!